Today’s new Overwatch comic was delightful and, among other things, revealed that Tracer is queer. She shares a nice smooch with her partner, Emily, and that’s pretty much the end of it. It is, however, a bit much for Russia. Rather notoriously, Russia has federally outlawed anything it deems to be “gay propaganda” that might be promoted toward minors. On paper, this means people are subject to fines, imprisonment, or deportation for anything from public demonstrations, to speeches, to discussions of gay rights with Russian youths. Over the years, the laws have prompted protests (especially when the 2014 Olympics were held in Sochi) and ire from human rights groups across the globe. 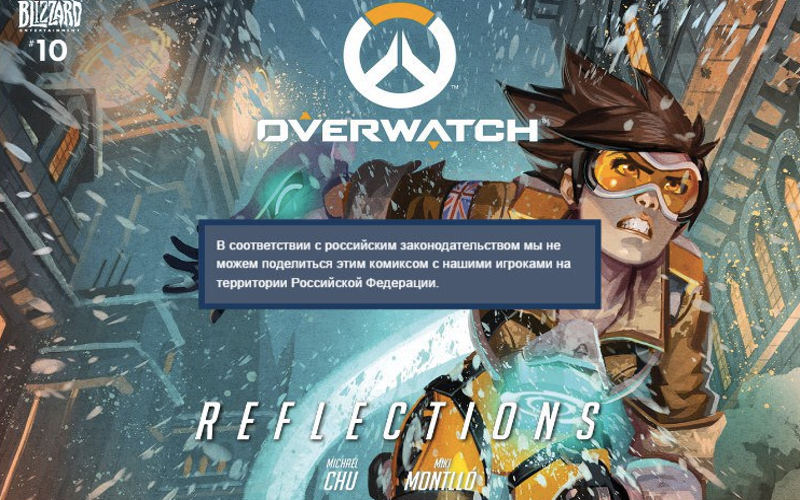 Given that the Overwatch holiday comic shows Tracer kissing Emily, it’s not hard to understand why this happened in Russia. It’s still heartbreaking, though, not just because of what happened (it is, after all, a comic about a video game), but because of what it represents. We like to talk about how there are rough times ahead, but for many, they’re behind as well. Worth keeping in mind that for some people, this is just another chapter in a very long, heavily censored story.